This week I finished up a group of 20 early-war French Dragon Portes from Crusader Miniatures. As is typical with Crusader figs, they were nice and easy to paint up. I'm still not 100% sold on the green I went with, but they're done now! And finally I have this group of four oxen from Wizkids. Simple figs, quick and easy to paint up. Next up will probably be some Germans and some hoplites. Finished up some more Counterblast figs. All the figs are from Bombshell Miniatures. First up from the Edofleini faction (Edo for short) is an Edo Undermind. The next pic (from left to right) is an Underling, a character named Destroys Nulls and a pair of Edokin Eyespies. Next from the Mekkus faction is a Cyren. From the Galactic Defense Force (GDF) faction (from left to right) is a GDF Psifer (psychic), a character named Sally Starfield and a GDF Commander. Also from the GDF is this Heavy Combot. And finally I've done up some more robots. First up is a pair of HOpR Bots. And finally is a pair of HLpR Bots and a half dozen MInE Bots. Commander for scale. Just finished a group of World War II 28mm French Goumier. These metal figs are from Artizan Designs. The figs have some mid-late war kit but I don't see why they can't be used for early-war. Painting the stripes was not fun. I can't see myself painting any more Goumier. I'll stick to basic French infantry. And now for the second half of my post. These 28mm figs are from Bombshell Miniatures Counterblast pulp sci-fi line. First up is a trio of Bde Bots and a Bz-R Robot. The next two groups of figs are from the Mekkus faction. The first pic is of a group of Aggressors. The second pic is of a trio of Braindrones. The next pic is a group of figs from the Edofleini faction. These are Edo Trappers. The pic doesn't really show the colouring of the figs unfortunately. Couldn't have a post without crappy pics! And finally I have a pic of Darth Vader and Luke Skywalker from Star Wars Legion. As the Analogue Hobbies Paint Challenge is in full swing, I've completed a few sets of figures. First up is a set of Imperial Scout Troopers for Fantasy Flight's Star Wars Legion. I was looking forward to having these figs painted but I was kind of leery about actually painting up the white and black. I found a few videos on Youtube that gave good tutorials on how to paint them quickly and easily. I think they turned out pretty good. Next up is a group of early World War 2 French infantry. These metal figures are from Black Tree Design. Just when I think I'm done with the French, I end up picking up more. I don't know what it is, but I really like painting French infantry. 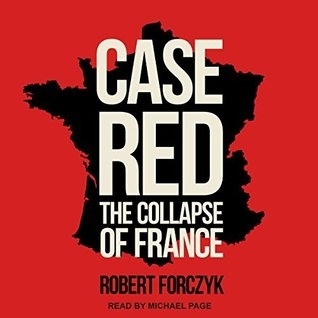 On a related note, I recently finished listening to the audiobook of Robert Forczyk's Case Red: The Collapse of France. It covers the period from the late 1920's up to the collapse and surrender of France. I recommend it if this period is of interest to you. And lastly, I finished a group of Frostgrave Gnolls. These figures are all metal except for the two in the back row with shields and these are from the plastic Gnolls set. All figures are from North Star figures. Honestly, I really don't like these figures and I think it's because I couldn't come up with a good paint scheme for the Gnoll skin and fur. I've got another 18 plastic ones on my paint table that I'm really not looking forward to doing. Up next some more French and maybe some sci-fi figs.